Students not only have the city to use as a resource, but also have access to Toronto’s large professional design community, many of whom teach at the school. In addition, the city’s multicultural networks and international connections make Daniels a powerful place to start a career. Daniels’ focus on interdisciplinary training and research will test your limits and challenge you to rethink design for the 21st century. The fields of architecture, landscape architecture, and urban design are characterized today by exceptional pressure for change. Globalization and the convergence of new media, materials, and building technologies have led to radical change in economic, technical, and aesthetic formations in the design fields. 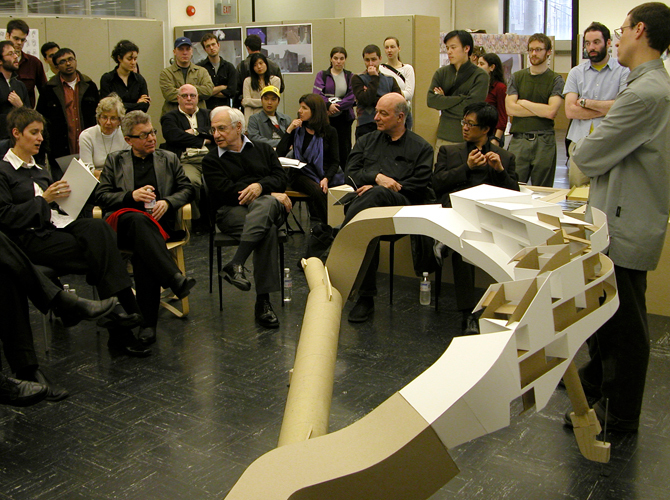 The John H. Daniels Faculty of Architecture, Landscape, and Design (Daniels) is responding to these shifts. As the largest city in Canada and one of the most dynamic in North America, Toronto is a thriving metropolis, providing exceptional resources for the aspiring architect, landscape architect, or urban designer to study the early twenty-first century human condition. Daniels has a global orientation in its teaching and research while simultaneously believing in the importance of sensitively addressing local forces. In this context, Daniels strives to harness the potential of Toronto’s distinctive multi-ethnic and multicultural society. The greater Toronto region serves as a dynamic laboratory for critical studies and the imaginative exploration of design alternatives that will be of consequence internationally. An Te Liu‘s installations and sculptures explore issues of function, malfunction and cultural coding in our built and hypothesized environments. He is Associate Professor in the Daniels Faculty of Architecture at the University of Toronto, where he also holds an Adjunct appointment in the Department of Fine Art.